The qualification rounds for the SCA 40 over league is complete. The group winners in both east & west is clear, and come from the centre of the country. Olten qualify with home advantage as winners of the east, while Berne qualify with a 100% record as winners of the west. For their respective opponents things were not so clear. Geneva XI Stars scraped through ahead of Geneva International by just two points and will meet Olten on Sunday 8th September at Hägendorf. Meanwhile Power qualify ahead of Nomads as runners-up in the SCA league east division by just one solitary point and now face the formidable task of beating Berne CC at the Marzili ground, also on Sunday 8th September. 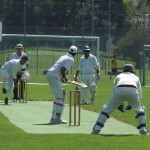 Initially Nomads appeared to have qualified as the result of a better run/wickets rate. However, on the request of Power CC, the league committee checked and recalculated the points allocations throughout the season and discovered a discrepancy that resulted in Power qualifying by a solitary point. On the request of Nomads there was another recount, but that hasn't raised any further discrepancies and the results, along with the points allocations stands. On the face of it, it would appear that Power's use of youth players throughout the season appears to have paid dividends, but in reality it was Nomad's result against Olten earlier in the year where they collected just one point that made the difference. For more information on the 2013 SCA league competition, the 2013 league tables and the semi-final stages, contact the SCA league chairman.